All transactions are safe and secure with a reliable history in online purchasing behind each of our associates. 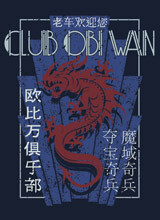 Buy the Club Obi Wan Indiana Jones t-shirt to own Indiana Jones clothing and merchandise. The Temple of Doom opens with Indy in a Shanghai nightclub named Club Obi-Wan, attempting to trade the remains of Nurhaci for a large diamond with a gangster named Lao Che. This unique Indiana Jones tee displays a logo for Club Obi Wan, Lao Che's popular Shanghai hot spot. The club's name is an obvious reference by Star Wars writer George Lucas to the famous Jedi character. Wear this piece of Indy merchandise underneath your Indiana Jones leather jacket. The shirt is a must have for die hard fans of the movies. In addition to the Club Obi Wan Indiana Jones tee above, browse the Indiana Jones Clothing Gallery for more apparel like men's and women's clothes, kids shirts or hoodies.